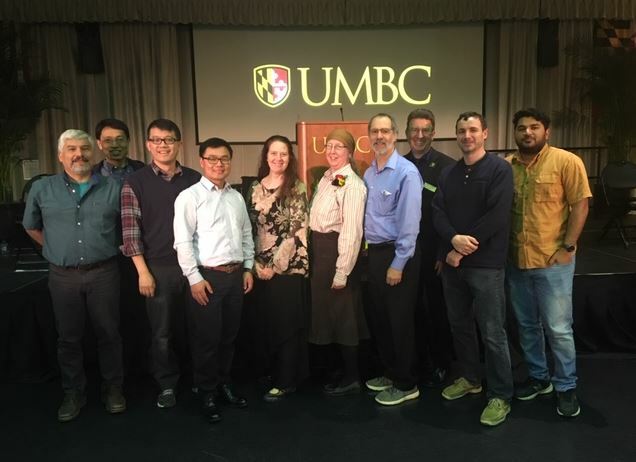 Dr. Lorraine Remer, Research Professor in UMBC’s Joint Center for Earth Systems Technology (JCET) and Affiliate Professor in the Departments of Physics and Geography and Environmental Systems, has been selected as the 2019 recipient of the UMBC Research Faculty Excellence Award. The award recognizes overall excellence in research, and where appropriate, significant contributions to teaching and service/leadership while at UMBC. Dr. Remer received her award at the 2019 Presidential Faculty and Staff Awards Ceremony held in the University Center Ballroom on April 3rd. Congratulations to Dr. Jae Lee (JCET/UMBC) who was presented with the Piers J. Sellers Award for Interdisciplinary Science from Director of Sciences and Exploration Directorate/GSFC, Mark Clampin, on Feb. 26, 2019 at the 12th Annual New Year’s poster party. 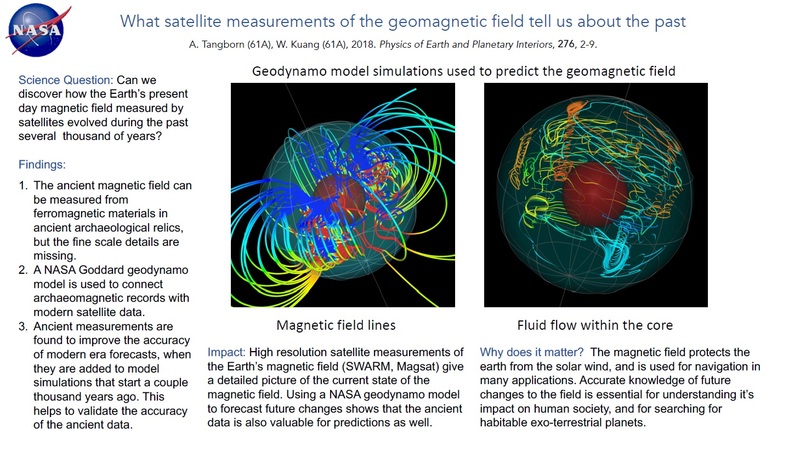 Her poster “Is There a Time Lag between Total Solar Irradiance and Sunspot Area?” explores two fundamental quantities in Heliophysics and Earth Science: the solar magnetic field emergence and total solar energy input to Earth. To examine the relationship between the two, she showed SDO solar disc images, ground observations of Sunspot area, and three different satellite measured total solar irradiance data from SORCE, TCTE, and newly launched TSIS. The Earth Day Symposium (EDS) is an annual event sponsored jointly by the UMBC Department of Physics and the Joint Center for Earth Systems Technology (JCET) that highlights local Earth science research from NASA, NOAA, university, and private sector affiliates. The event aims to strengthen collaboration between UMBC and JCET researchers, graduate students, and the local Earth science community. An iceberg twice the size of New York City is poised to break away from the Brunt Ice Shelf in Antarctica, sparking safety concerns for scientists in the area. The iceberg would represent the largest break off there since scientists first began monitoring the area, in 1915. In a release, Nasa says that a crack has been growing at a rate of about 2.5 miles (4km) per year since 2012, and that the chasm was dormant before that time. That northward growing crack could soon meet with another growing chasm, the so-called “Halloween crack” that was discovered in October of 2016 growing eastward form the McDonalds Ice Rumples. Nasa scientist Chris Shuman told The Independent that the size of the iceberg — around 1,700 square kilometers, or about 656 square miles — would make it the fifth largest iceberg that is currently being tracked by the National Ice Centre in Suitland Maryland. “What is driving this is the natural, long-term flow of glacial ice off of the margins of Antarctica so that the advancing ice begins to float on the sea (in this case the Weddell Sea, forming the Brunt Ice Shelf),” Mr Shuman said. “Year-by-year, the ice moves farther offshore as it is supplied by the glaciers inland until the forces of tides, currents, storms etc… begin to crack the floating ice”. Valerie Casasanto of the UMBC Joint Center for Earth Systems Technology (JCET) is one of the 2018 Robert H. Goddard Honor Award winners from code 600 for her work with the ICESat-2 Outreach Team. Please be sure to congratulate Val for her hard work and dedication to the success of Goddard, UMBC and JCET. Her professionalism is deeply appreciated. In the 2017 HERD period, UMBC received an NSF Major Research Instrumentation award to expand the university’s High Performance Computing Facility. Also in computing,Ting Zhu, assistant professor of computer science and electrical engineering, received a prestigious NSF CAREER Award for his work to develop “Internet of Things” technology. Dr. Thorsten Markus – head of NASA Goddard’s Cryospheric Sciences Lab and the Project Scientist for the ICESat-2 mission, talks about the science behind the study. The event was sponsored by NASA and the University of Maryland, Baltimore County, at Solvang Festival Theater. Lia Oganesyan, a virtual reality innovator and TED Entrepeneur-in-Residence, leads the audience using their smart phones to see a virtual reality earth via an app called HoloGLOBE and paper cube. They were participating in a live music and multimedia art and science program titled “Beautiful Earth,” on Friday, Sept. 14 at Solvang Festival Theater. Kenji Williams, composer and director of “Beautiful Earth,” a music and multimedia art and science program about the ICESat-2 satellite, plays violin to animated graphics about the program. The event was sponsored by NASA and the University of Maryland, Baltimore County, at Solvang Festival Theater. Spectators look at a scale model of ICESat-2, as is scans the earth with lasers, before a live music and multimedia art and science program titled “Beautiful Earth,” on Friday, Sept. 14 at Solvang Festival Theater. Solvang Theaterfest Executive Director Mary Ann Norbom welcomes the audience as Valerie Casasanto, ICESat-2’s education and outreach lead, to “Beautiful Earth,” a music and multimedia art and science program about the ICESat-2 satellite. The event was sponsored by NASA and the University of Maryland, Baltimore County, at Solvang Festival Theater on Friday. Please plan to attend the JCET All Hands meeting Tomorrow at GSFC. Congratulations Dr. Ali Tokay on receiving NASA’s GSFC Code 610 Atmospheres Performance Award in the category: Outstanding Performance – Outreach or Mentoring for his sustained mentoring of students in research internships. Congratulations Dr. Yujie Wang on receiving NASA’s GSFC Code 610 Atmospheres Performance Award in the category Noteworthy Contribution Group Award for Development of code MAIAC and release of MODIS collection 6 operational data product MCD19. The United Launch Alliance (ULA) Delta II rocket with the NASA Ice, Cloud and land Elevation Satellite-2 (ICESat-2) onboard. Coming to California for launch? Check out ICESat-2’s launch week activities near Vandenberg Air Force Base at https://icesat-2.gsfc.nasa.gov/launch-info to find out information on where to catch our hands-on exhibits, a teacher workshop both in person and on Facebook Live, and a live multimedia music and science performance Sept. 14 (RSVP here: https://bit.ly/2x8I51J). Host a launch party with materials at https://icesat-2.gsfc.nasa.gov/launch-info, and tune in to NASA TV at 8:10 a.m. ET/5:10 a.m. PT for the start of our launch broadcast! This semester’s JCET Seminar features Jess Herpel from the Maryland Department of the Environment as the kick-off speaker, on Tuesday, September 11. Please note the new time for the seminars this semester, 10 – 11 AM, in PHYS 401. This Summer, students and faculty from UMBC and three additional universities teamed up with NASA researchers and Maryland’s Department of the Environment to collect huge amounts of data that will provide a snapshot of air quality in the Baltimore-Washington metropolitan area and over the Chesapeake Bay. The study measures factors ranging from wind speed to ozone concentration. “In trying to understand air quality near the coast, it’s critical to obtain measurements over the water and over the land simultaneously with as wide of a variety of instruments as possible,” says John Sullivan, Ph.D. ’15, atmospheric physics, and the lead NASA researcher on the project. UMBC serves as the primary land-based site, and equipment placed on remote Hart Miller Island in the Bay collects data over water. “With two sites, you can begin to really answer questions pertaining to differences in air pollution and understand the mechanisms driving these differences,” Sullivan explains. This summer’s work is an extension of the Ozone Water-Land Environmental Transition Study (OWLETS), dubbed OWLETS-2, and it is particularly focused on tracking the presence of ozone in coastal cities. 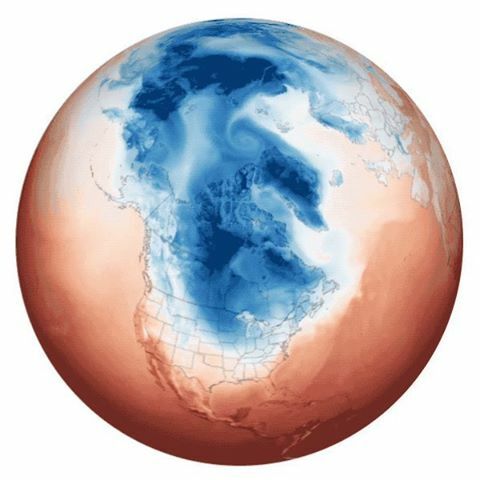 Ozone in the upper atmosphere helps maintain Earth’s temperature and absorbs harmful UV rays. However, near ground level, breathing in ozone causes inflammation in the respiratory system, which can be dangerous for young children, the elderly, and those with asthma or other respiratory conditions. Plants also take up ozone, which can reduce crop yields. Chemical reactions between sunlight and emissions from vehicles and industry generate smog-like ozone episodes, so one would expect the highest concentrations at midday, when the sun is at its brightest. However, wind over the Bay changes that. “The Bay breeze is like a wall that doesn’t allow normal west to east airflow to happen,” explains Ruben Delgado, assistant professor at the Joint Center for Earth Systems Technology (a UMBC-NASA partnership) and the lead UMBC OWLETS-2 researcher. That means the midday ozone heading out to sea comes back in during the late afternoon, causing a spike just as local residents are heading home from work and school. Other factors, such as smoke blowing over the city from wildfires in the West, can also have a real impact. Better understanding how these issues influence the presence of ozone in Baltimore can help improve air quality forecasts and protect sensitive populations from ozone’s ill effects. “The National Weather Service is interested in this kind of data, because it allows them to push their models to a new frontier,” Delgado explains. Working with Delgado are students from UMBC, Howard University, City University of New York, and Hampton University. 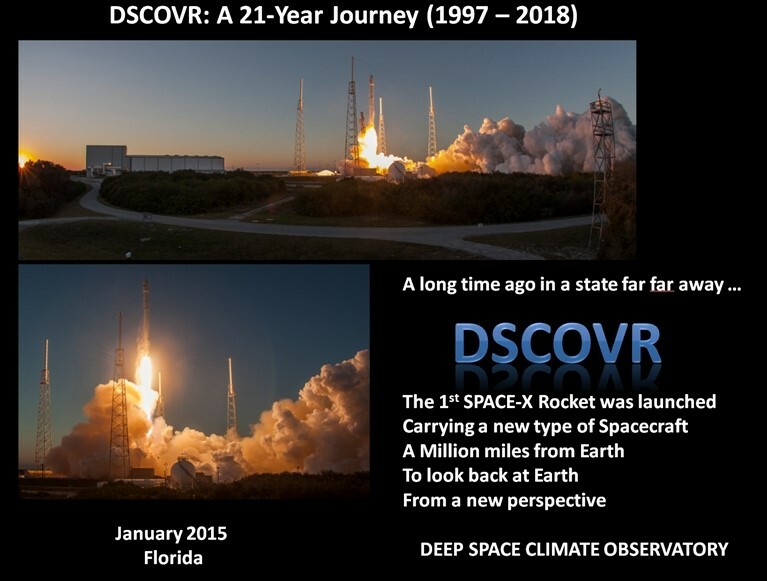 The students and their home-institution faculty mentors are all members of the NOAA-funded Center for Earth System Sciences and Remote Sensing Technologies and Center for Atmospheric Sciences and Meteorology. Ball learned that field and lab research differ in important ways. “Not everything is easy to deal with when you’re miles away from an actual lab where you have all of the necessary parts, chemicals, and even just clean water that you need to deal with problems that arise,” she says. Working with much more experienced team members, Ball was intimidated at first, but soon felt at home on Hart Miller Island. “Hearing from people with such impressive qualifications that your input on the situation truly matters expanded the confidence I had in myself as a researcher,” she shares. Ali Tokay (JCET/UMBC, Code 612.0) presented a course on In-Situ and Remote Sensing Measurements of Precipitation at the Center for Weather Forecasting and Climate Studies (CPTEC), Cachoeira Paulista, Brazil during August 6-9, 2018. The course included wide range of topics including fundamentals of raindrop size distribution and rain parameters, ground-based precipitation measurements by rain gauges, disdrometers, and vertically pointing and scanning radars, global and regional precipitation products, space-borne precipitation measurements focusing on Global Precipitation Measurement sensors and algorithms. The course has drawn 40 registered participants from about 15 different institutes across Brazil. Matt Rutherford and Nicole Trenholm weren’t going to let bad news about a grant for this year’s arctic marine expedition stop them. So they hitched a ride. Friends with boats, right? “The deal is they will take us into Greenland waters for our research in exchange for me helping them navigate the toughest sections of the Northwest Passage,” Rutherford said. He met the owners of the boat while delivering a boat from Panama to San Diego a few years back. 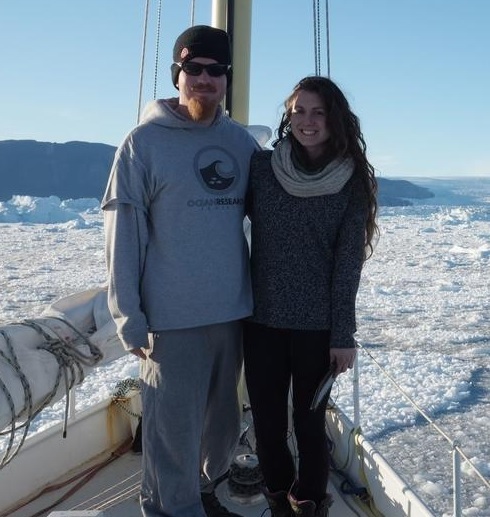 The couple, who make up the Ocean Research Project using the small platform of a sailboat to perform marine research delving into man’s effect on the world’s oceans, was determined to get back into the Arctic for follow up research from their 2016 mission to northern Greenland. And they were buoyed after co-publishing a paper with NASA scientists and the Oceans Melting Greenland (OMG) project, published by Oceanography magazine in June, based on their research into ocean temperatures affecting Greenland glacier melt. And further boosted by the donation of a 65-foot steel-hulled Bruce Roberts sailboat to their cause. It needs some sprucing up, but should prove to be a vessel for the long haul. They took off from their home base in Annapolis July 23, flying to Reykjavik, Iceland, then to Greenland. The scientist half of the operation is Trenholm while Rutherford, famous for his 2012 single-handed nonstop voyage around the Americas — the first to ever accomplish the sailing feat — is the captain and spark plug. Trenholm, who also has a blog and teaching arrangement with Anne Arundel County Public Schools STEM program, posted some details after they made it to Aasiaat, Greenland, a small village about a third of the way up the icy coast. They boarded Toboggan, the boat they hitched a ride on, and took off up Disko Bay to record water temperatures approaching Jakobshavn Glacier, known to calf off chunks of ice the size of New York City. “With our CTD instrument, which measures conductivity, temperature and depth, we indeed found that warm water,” Trenholm wrote. From there they moved north to Upernavik to check ice charts and gear up to cross Baffin Bay into the Northwest Passage, a three-day sail. By Friday night they were just off Devon Island, the largest uninhabited island on earth, at the eastern end of the passage. They plan to conduct more research. 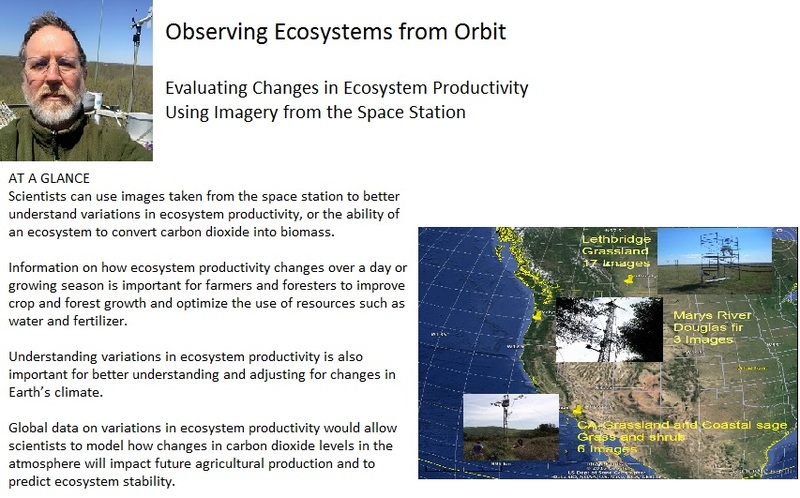 The NASA Applied Remote Sensing Training (ARSET) program offers satellite remote sensing training that builds the skills to integrate NASA Earth Science data into an agency’s decision-making activities. Training sessions are offered in many areas of remote sensing, including air quality, climate, disaster relief, health, land, and water resources. These trainings, offered both online and in person, have a world wide reach of over 13,000 participants and more than 3, 600 organizations. Managed by Ana Prados , the ARSET program team consists of Training Coordinator, Brock Blevins, Technical Writer and Editor, Elizabeth Hook Program Evaluator, Annelise Carleton-Hug and Project Support, Marines Martins. There are many specialty leads and instructors including Melanie Follette-Cook, Pawan Gupta, Amber Jean McCullum, Amita Mehta, Erika Podest, and Cynthia Schmidt. The photo above is from an in-person training last week July 10-12, “Satellite Remote Sensing of Dust, Fires, Smoke, and Air Quality” conducted by Pawan Gupta and Melanie Follette-Cook. With assistance from Elizabeth Hook, Brock Blevins, and Selwyn Hudson-Odoi. This training was coordinated with Washington State University who hosted the training in partnership with the Environmental Protection Agency (EPA) Region 10, and the US Forest Service Pacific Northwest Research Station. Over the course of three days, 39 participants from 25 organizations attended the training. 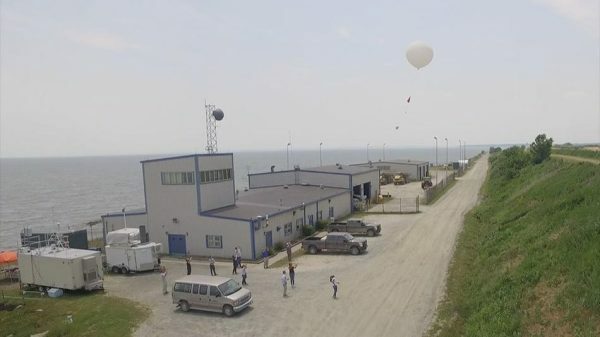 The sky above Hart-Miller Island became a busy laboratory for several weeks this summer as researchers launched balloons, drones and planes to better understand the complex swirl of air pollution over the Chesapeake Bay. State and federal agencies initiated a research study aimed at providing more detailed data on how and why the Chesapeake Bay seems to act as a magnet for ozone pollution, amplifying the smog before it is then blown back over land. “The study is an exciting example of cutting-edge research on the interface between land and water,” said Maryland Environment Secretary Ben Grumbles. The study attempts to understand in a three-dimensional way what happens to the emissions of power plants, cars and other pollutants once they gather over the Chesapeake Bay. The results could help Maryland make the case for forcing sources of air pollution in states upwind to better control their emissions. Maryland officials blame air pollution from upwind states for more than two-thirds of the smog that forms over the Baltimore and Washington regions. On hot summer days, the sunlight and heat trigger chemical reactions between pollutants and other compounds in the air, multiplying what is known as ground-level ozone. Ozone is a form of oxygen found naturally in the upper atmosphere that protects the Earth from ultraviolet radiation, but ground-level ozone is a key ingredient in smog and can cause or aggravate breathing or heart problems in humans. Already this year there have been eight days when Baltimore’s air quality exceeded U.S. Environmental Protection Agency standards. Ozone is created by the chemical reactions between pollutants known as nitrogen oxides and volatile organic compounds. Nitrogen oxides come from the combustion of fossil fuels in cars and power plants. The nitrogen often falls out of the air as ozone is created. About a third of the bay’s nitrogen pollution falls from the air onto the land and water, said Ariel Solaski, a staff litigation attorney at the Chesapeake Bay Foundation. Excess nitrogen in the bay contributes to algae blooms and dead zones. Significant improvements in the bay’s water quality have been seen since nutrients including nitrogen have been reduced in the rivers and streams flowing into the bay. Aerosol-cloud interaction continues to puzzle climate scientists. It is among the most significant contributors to our climate but least understood. Aerosol-cloud processes are poorly represented in climate models and measurement requires high accuracy, narrow resolution, and cooperation between different instruments. Several studies converge on the idea that a multi-angle imaging polarimeter, with high accuracy and narrow spatial and angular resolution, is the strongest candidate to sample cloud and aerosol properties at the level required for climate study. The Hyper-Angular Rainbow Polarimeter (HARP) is a wide field-of-view camera, designed and developed by J. Vanderlei Martins and the Laboratory for Aerosol and Cloud Optics (LACO) Group at UMBC to fill this role. Over the past year, AirHARP, the HARP instrument adapted for aircraft, flew on two NASA research campaigns: the Lake Michigan Ozone Study (LMOS) and the Aerosol Characterization from Polarimeter and LIDAR (ACEPOL). The LMOS campaign was a joint NASA-NOAA-EPA effort to explore the connection between lake breezes and high ozone exceedance levels on the eastern coastline of Wisconsin in the summer months. AirHARP took data on many B-200 flights alongside the NASA Langley Research Center (LaRC) GeoTASO instrument, a trace gas experiment that measures ozone pre-cursors, such as NO2, through the entire atmospheric column. Brent McBride, a Ph.D candidate in Martins’ group, operated AirHARP on-board the B-200 and led field operations on the ground throughout the campaign, while LACO group members engaged remotely from UMBC. While AirHARP does not have trace gas sensitivity, measurements of convective clouds and low aerosol levels over eastern Wisconsin will be compared to co-incident observations made by AERONET sun photometer sites and the Advanced Baseline Imager (ABI) on the GOES-R geosynchronous satellite. Clouds play a prominent role in moderating Earth’s climate, but their role is still poorly understood. Generally, clouds cool the Earth by reflecting incoming sunlight back out into space. Reducing the clouds’ reflectivity—with a layer of pollution, for example—reduces the cooling effect. However, new research in Proceedings of the National Academy of Sciences by Zhibo Zhang, associate professor of atmospheric physics at UMBC, two of his students, and collaborators from University of Wyoming, University of Science and Technology of China, Universities Space Research Association, and University of Michigan adds another level of complexity to this model. Every fall, fires race across central and southern Africa. Many are wildfires; others are intentionally set by humans to clear farmland. They create so much smoke that it’s clearly visible from space. Wind sweeps the smoke westward over the Atlantic Ocean, where it rises above the largest semi-permanent gathering of clouds in the world. For years, scientists believed that overall, the smoke diminishes the clouds’ cooling effect by absorbing light that the clouds beneath otherwise would reflect. The new study by Zhang and colleagues doesn’t dispute the existence of this effect, but introduces a new mechanism that counteracts it by making the clouds more reflective.